The first Fine Asian Art and Antiques sale in 2016 for Kaminski Auctions takes place on February 28 starting at 10:00 am and features important Chinese and Asian porcelains, jade, silk embroidery, bronze, silver, furniture, paintings and much more. Among the best pieces are Chinese porcelains from the Howard Coleman collection including the three outstanding Qing dynasty grand porcelains all estimated at $20,000-30,000. The first Fine Asian Art and Antiques sale in 2016 for Kaminski Auctions takes place on February 28 starting at 10:00 am and features important Chinese and Asian porcelains, jade, silk embroidery, bronze, silver, furniture, paintings and much more. 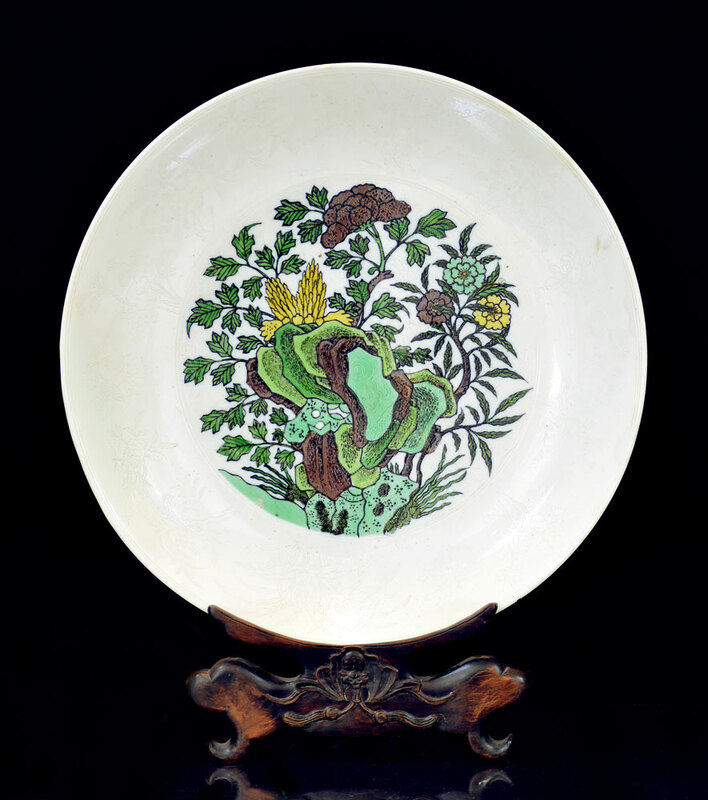 The majority of lots in this sale are Chinese porcelains. Among the best pieces are those from the Howard Coleman collection including the three outstanding Qing dynasty grand porcelains all estimated at $20,000-30,000. They include a 26-inch high under-glazed blue and white vase of hexagonal shape with a bulbous stomach, decorated with fruit boughs of pomegranates, peaches, persimmons and alternating with floral branches of peonies, chrysanthemums and lotuses. It has an under-glazed six-character Qianlong reign mark on the base attached by a bronze plaque. There is also a 19-inch diameter rare and massive Chu Xiu Gong plate decorated with rocks nested amid flowered branches. The raised rim is decorated with blossoms of lotus, chrysanthemums and camellias with five clawed painted dragons among the flowering foliage. Another important piece from the collection is a 17-inch high copper-red under-glazed fish bowl, decorated with two five-claw flying dragons chasing a flaming pearl on a white background. The fish bowl bears the six-character Kangxi reign mark at the bottom and is seated on a carved wooden stand. Apart from the Coleman Collection, a Chinese Ming dynasty Wanli period famille verte Gu vase stands out. It is in the shape of a double gourd with petal rims, decorated with sea monsters on a melon shaped stomach with flowers and dragons on the neck and mythical creatures on the foot. The vase bears the Wanli mark on the neck and measures 14 3/4inches in height. It is estimated at $10,000-$20,000. 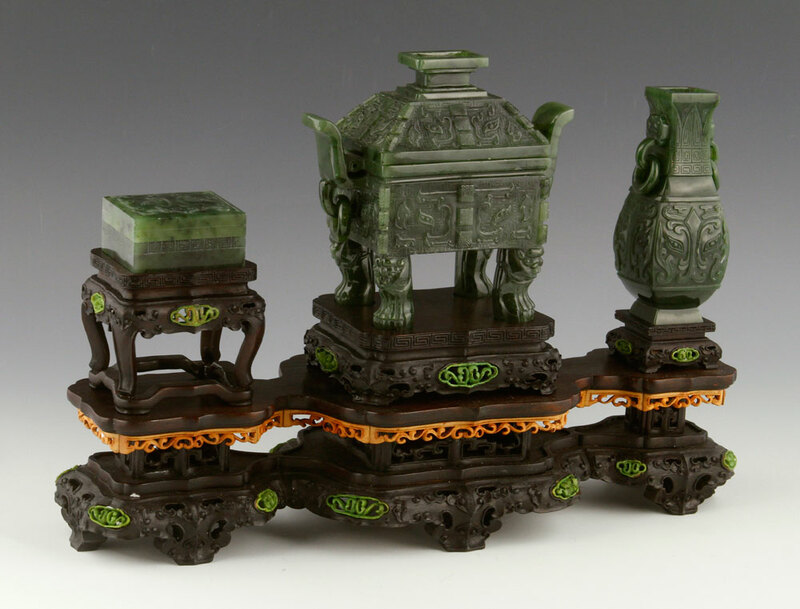 Jade items of interest in the sale include a Chinese spinach green scholar's set consisting of three rectangular carved pieces with Taotie Pattern throughout the body. The set includes a vase, a censer and an ink box with Qing Qianlong mark on the base. The three jade pieces fit on a Zitan wood stand, decorated with orange openwork carving on the skirt and interspersed with a green colored pattern. The set is 9 ½ inches in height and 13 ½ inches wide with a sale estimate of $6,000-$9,000. The top silver lot is a Chinese Qing dynasty export tea set with a total weight of 56.2 troy ounces. The tea set is chased and embossed with "The Four Gentlemen" as well as plum blossoms, orchids, chrysanthemums and bamboo. The handles, lids and spouts are in the bamboo style. It has a Shao Ying Tang company mark on the base and is estimated at $4,000-$6,000. The highlight of the furniture in the sale is a pair of 18th century Huanghuali armchairs having an estimated value of $2000-$3000. 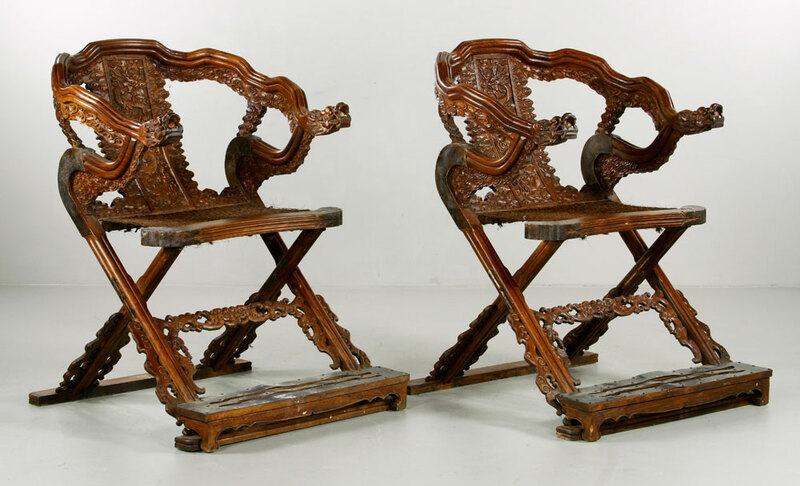 The chair arms consist of two flying dragons, the back panel is decorated with carved flaming dragons and cloud shaped carvings surround the legs. Noteworthy bronze items include an 18th century Sina-Tibetan gilt and bronze Guanyin figure, 6 ½ inch high with the sale estimate of $1500-$2500. It has four hands, one raising a sword and is seated with crossed legs. The other piece is from a Massachusetts estate, and is a Mid-Qing dynasty gilt bronze dragon belt buckle, 2 3/4 inches wide. It features one dragon on the center of the buckle with two others on each side. 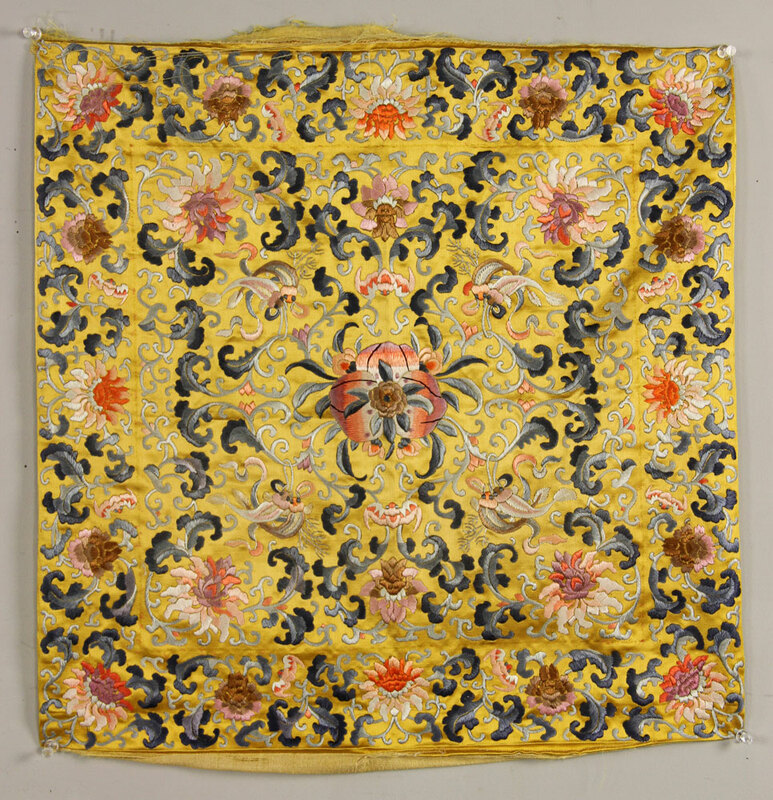 Silk embroidery and textiles play an important role in the sale as well. The selection includes a 20 inch high by 20 inch wide Chinese imperial yellow embroidery panel with flower needlework on a bright yellow background, a 50 high x 54 wide Chinese unused dragon robe textile embroidered with flying dragon, cranes, bats, clouds and colorful waves on the black background and several late Qing dynasty women's winter robes, such as Manfu and Hanfu. Preview for this sale is Thursday through Saturday, February 25th-27th 10:00am-5:00pm and February 28th, starting at 8:00am at the Kaminski Auctions gallery at 117 Elliott Street, RT.62, Beverly, Massachusetts. For more information go to http://www.kaminskiauctions.com and sign up to bid online with KaminskiLIVE.